Upper low and collocated surface low will be situated to the SW of Ireland today, with an upper level and surface high centred near Iceland. 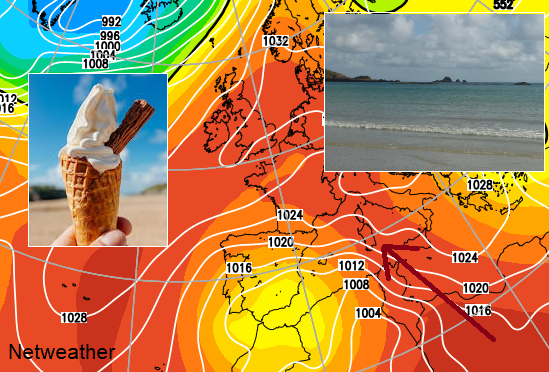 A slow-moving frontal boundary will lie from NW Ireland across Wales and onto SE England. Heavy showers and isolated or scattered thunderstorms will feature along and just north of the front. Corridor of warm/moist air advection northwestwards from near continent to the north of a warm front lying between Wales and SE England will become modestly unstable this afternoon with surface hearing – where cloud breaks occur – yielding 200-500 j/kg CAPE in places. The frontal boundary will support showery outbreaks of rain for much of the day, but where low cloud and mist thins and breaks to allow some warm sunshine just north of frontal boundary cloud shield, surface heating and surface breeze convergence will alllow heavy showers and isolated or scattered thunderstorms to develop – accompanied by hail and intense rainfall locally, with a risk of localised flooding, given slow-moving nature of cells. Thundery showers with isolated lightning will continue along/near frontal boundary overnight, which will slowly sink S across Wales and S England. Localised flooding will be possible with this activity, especially later in the night. 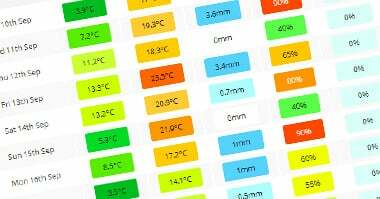 Issued by the Netweather forecast team whenever there is a risk of storms or severe convective weather, these discussion based and in depth forecasts will highlight the areas at risk and give an in depth description of the risk and the factors surrounding it. 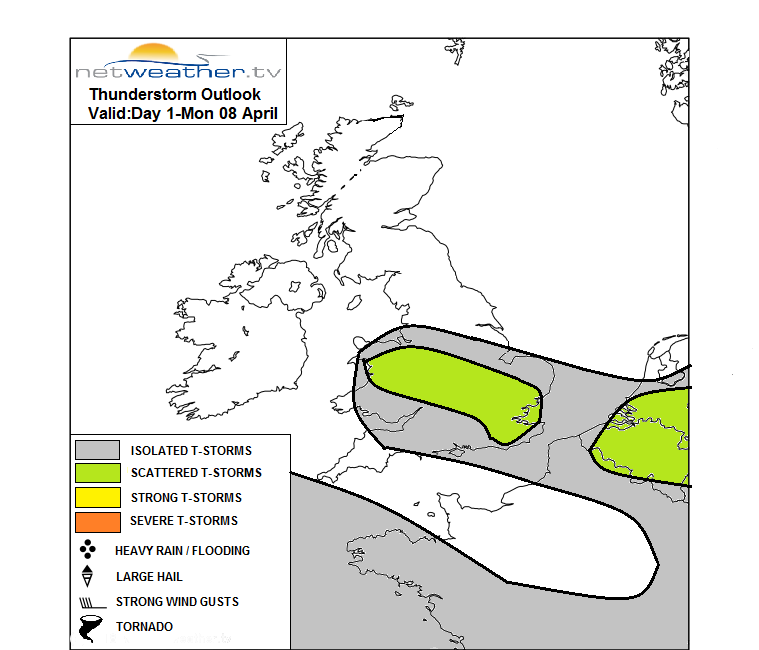 Thunderstorms - Severe thunderstorms unlikely to occur, slight risk of hail, gusting winds and localised flooding. Slight Risk - A slight risk of severe convective weather exists. Hail >2.0cm diameter, wind gusts exceeding 50mph or 5-10% risk of a tornado within 50 miles of a point, or > 30% risk of localised flooding. Moderate Risk - A moderate risk of severe convective weather exists. Hail 4-5cm in diameter, or wind gusts of 60-70mph, or a 10-15% chance of a tornado within 50 miles of a point, or >50% risk of localised flooding. High Risk - A high risk of severe convective weather exists. Rarely, if ever used on the UK. Hail >5cm, or wind gusts in excess of 80mph, or >20% risk of a tornado within 50 miles of a point, or >70% risk of localised flooding.